Juliette Silverton: [Interrupts] That what? Nick Burkhardt: That most people can't. Juliette Silverton: You mean, like, ghosts? Nick Burkhardt: No, no. Not the dead. Juliette Silverton: Well, that's good. The private detective Nathaniel Adams follows and takes photos of Nick, Hank, Renard and Monroe. 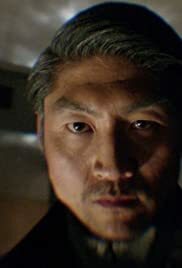 The wesen Akira Kimura, who killed Nick's parents, arrives in Portland searching for the Zakynthos gold coins. He meets Nathaniel in the hotel room and he tells to Akira that Renard, Hank or Nick might have the coins. Akira kills Nathaniel and chases Renard. When the body is found by the chambermaid, Nick and hank sees the photos and send Sergeant Wu to Renard's apartment, but Akira is torturing him. A mysterious woman in black is tracking Akira's steps. Meanwhile Juliette is scratched by Adalind's cat in her clinic. When Nick is aware of the happening, he wants to take Juliette to a hospital, but she refuses to go. Nick decides to bring Juliette to his trailer and disclose his secret to her to convince Juliette how dangerous Adalind is. What will be the reaction of Juliette? "Woman in black" is the last and the best episode of the First Season of Grimm. The secret of the mysterious woman in black is totally unexpected and a great surprise. Juliette is an annoying character and does not deserve to share the secret of Nick. What will be the effect of the poison in Juliette is a good question. How will Nick react to the secret of the woman in black is another great question that we will see in the next season. My vote is ten.